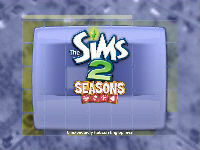 The Sims 2 Seasons : Heatwave or Clouded Over? 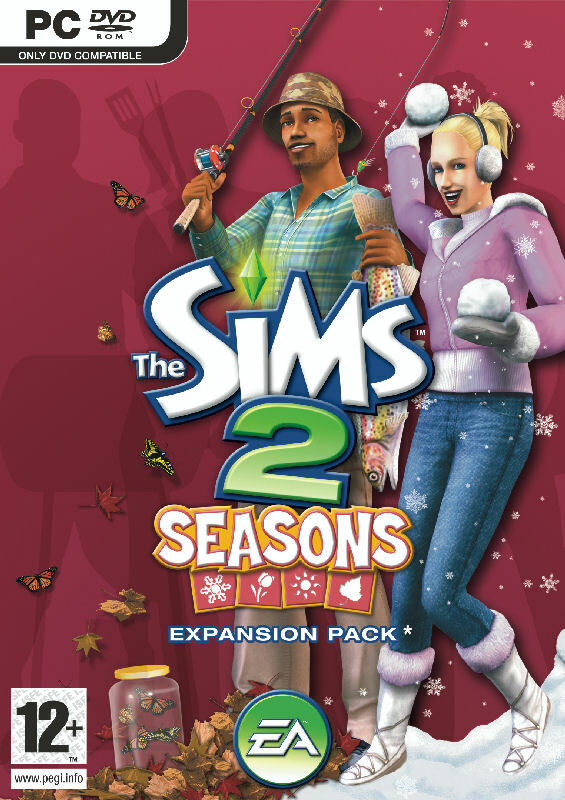 Considering before TS2 was released, we were led to believe that it was going to include weather but was dropped near the end of development because of bugs, an expansion pack including weather is long overdue. This in depth review intends to look in detail at everything that this expansion pack has to offer, see what it has drawn from previous EPs for TS2 and TS1 and ultimately draw conclusions as to whether we recommend to buy it or not. Let's just cut to the chase and assume we've installed it, either from DVD, CDs or direct download. It's now time to load it up. Back in "ye olden tymes" of TS1, the introductory movie was finally changed with EP5 "Unleashed". 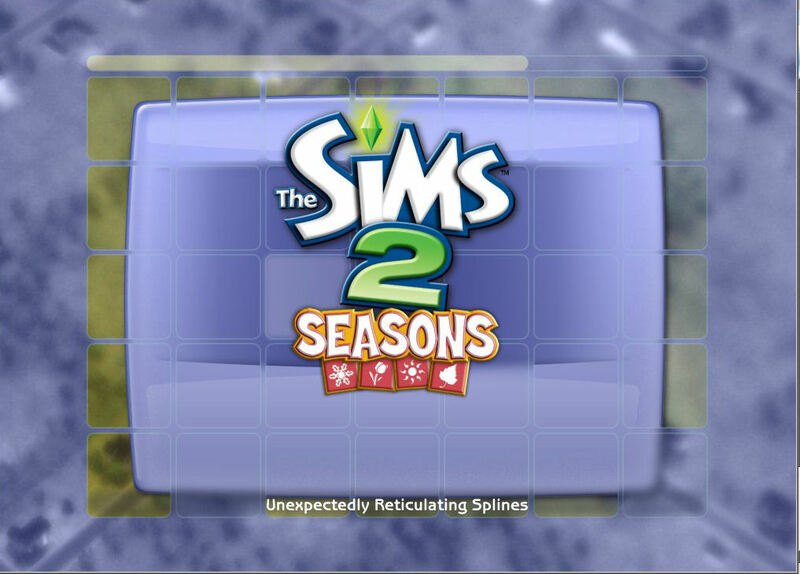 Considering this is the EP5 for TS2, I would have thought by now that they might have changed the introductory movie. Well, they haven't. No clips of new features. Nada. It is still the same thing that we saw back when TS2 was new to us. After that, the game loads up normally with a new set of appropriately themed comments along the bottom. Either I'm becoming jaded with old age or I'm expecting too much but I felt that the splines comment wasn't too imaginative this time around. Considering it is only there for a few seconds, it is a minor gripe. 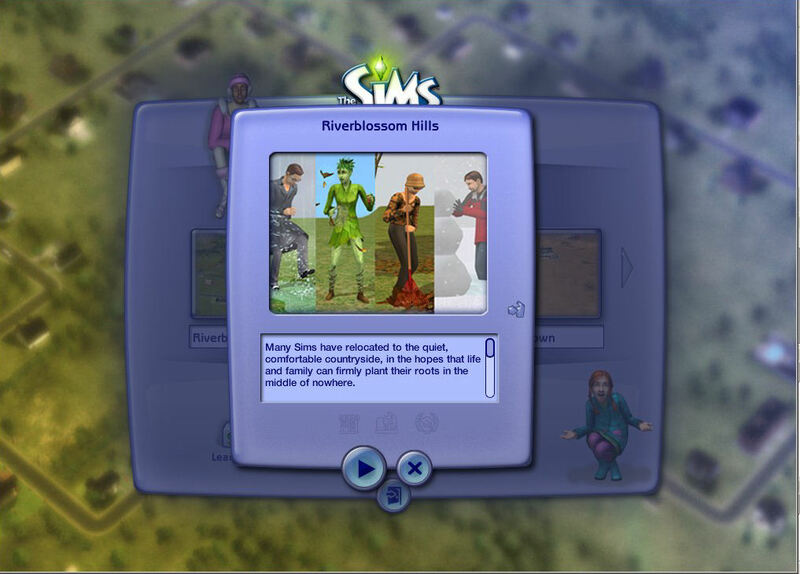 The game swiftly loads up and the first thing that is noticeable is the new neighborhood of Riverblossom Hills. Admittedly, this is a first. With previous expansions, we've had university town, downtown and shopping villages to add on. Riverblossom Hills is a completely different neighborhood with all new families and backstories. The last time anything was done like this that was remotely close was when "Unleashed" quadrupled the size of the neighborhood by incorporating Sim Lane into Old Town. Looking briefly through the occupants of this new neighborhood and it looks like a relative of the Jolly Green Giant has taken up residence. I will be looking at this EP's weirdness later on. To put it simply, this is the first time since the aliens of Strangetown that Maxis have given us an example of the game's weirdness from the "get go". Humans had to be turned into Zombies, Vampires & Werewolves as part of a gradual process and servos had to be built by highly skilled roboteers. For those who wish to play weirdness without the hassle, now it can be done. There is also a family here called the Roths. Morty & Stella Roth with their children Sandra and Xander seem to remind me of a famous family from Pleasantview. I'm sure I'm not the only one to think this way. The neighborhood is well designed and appears to be like a small hillside farming community. on first impressions, the wintery terrain is very atmospheric. By default, the seasonal appearance of the neighborhood is set to either first season of the year. After you have visited a house, the neighborhood appearance is changed to that of The season in the house you have just left. It can be Winter in one house, Spring in another and Autumn in a third. 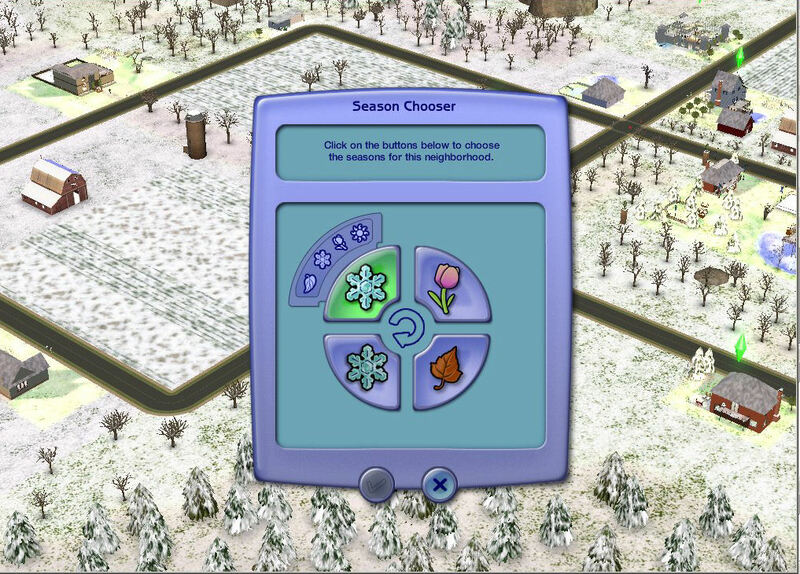 From the neighborhood screen, you are given the option to change the seasonal cycle. Currently, there is no summer in Riverblossom Hills. It is Winter for half of the year with Spring and followed by Autumn. I will be looking in detail at the seasonal cycles in a later part of this review and in detail at the different effects of the seasons. Yes, I don't need to remind you about how much I like the neighborhood decorations. Once I have loaded up a neighborhood, it is one of the first things that I look for. I am always keen to find out what is new and with this expansion ... frankly, there isn't much. There is a barn, a farm silo and there is a Moai statue. That's it. On this occasion, I suppose I cannot be overly critical as they have put in four sets of seasonal effects to change the neighborhood view dependant, upon the seasons. I have not had the opportunity to see how Desert, Dirt and Concrete terrains are affected but for the Temperate/Lush terrain, it does look very good. 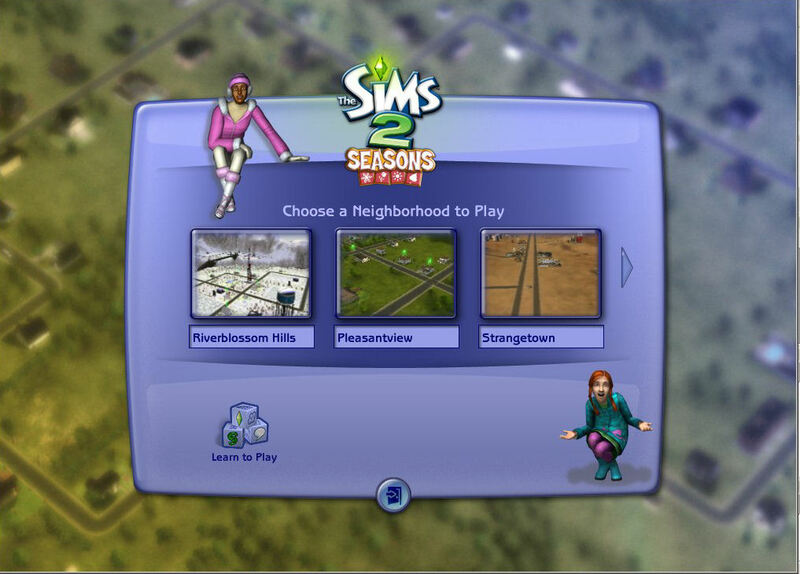 To be honest, I would have liked to see more and I am still waiting for a utility to modify the street layout of neighborhoods, but I am now giving up hope on seeing that or any other utilities considering TS3 is due out in 2 years. Hopefully, something will be integrated into that game. Otherwise, I will be giving up hope altogether. Anyway, putting those gripes aside, looking down from the sky, this looks quite good. In the next part, we will be creating a new family and looking at the changes in that area. Written at 05:27 on Monday 5 March 2007 by Andy.